the beach house, mountain cabin, or anywhere you share good drink and fun times with friends. that are laser engraved for a neat, attractive look. 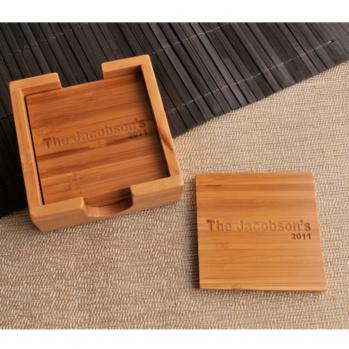 Made of a renewable resource, these natural coasters are eco-friendly too! Coaster measures 3 7/8" x 3/8". Holder measures 1 7/8" x 4 5/8". Coaster measures 3 7/8" x 3/8". Holder measures 1 7/8" x 4 5/8"